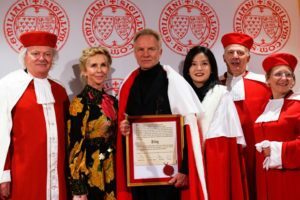 The Saint-Emilion Jurade inducts Sting! On April 6th, the prestigious Saint-Emilion Jurade inducted Sting into its historic, 3,000-member organization. Chinese Actress Zhao Wei, a dear friend of Sting, hosted guests at her recently-restored Château Monlot Estate. The inauguration featured a red carpet, singers and performers, a fireworks display and a video presentation mapping the Château’s history. 3-star Chef Christian Le Squer of The Four Seasons George V in Paris created the event’s dinner.